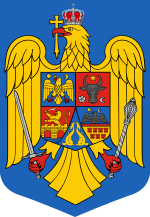 The Coat of arms of Romania is the coat of arms that has been adopted by the Romanian Parliament on 10 September 1992. The design for it came from the coat of arms that the Kingdom of Romania created back in 1922. It displays a golden aquila that is holding a cross in its beak. It also shows a mace and a sword in its claws. It contains the three colors of the Flag of Romania: red, yellow, and blue. This page was last changed on 17 July 2016, at 23:15.